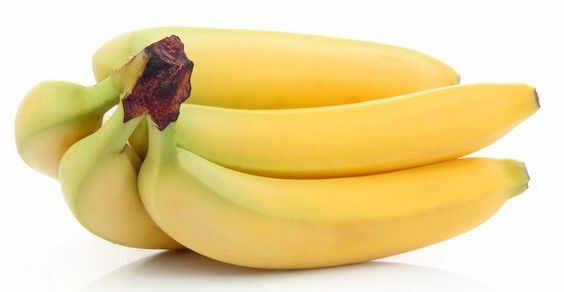 As we know, bananas are rich in potassium! What maybe not everyone knows is that potassium in nature is present with three isotopes: 39K (93,3%), 40K (0,0117%) and 41K (6,7%), 40K potassium is unstable and decades in beta mode. This means that potassium present in nature, even that contained in bananas (or in our body) is slightly radioactive! In fact, the “banana equivalent dose” was also defined at scientific level (banana equivalent dose aka BED) is a unit of measure of the equivalent dose, used in informal contexts to establish an intuitive relationship between a given radiation dose and that absorbed by eating a banana. In detail Potassium-40 (40K) is a radioactive isotope of potassium which has a very long half-life of 1.251 × 109 years. It makes up 0.012% (120 ppm) of the total amount of potassium found in nature. Potassium-40 is a rare example of an isotope that undergoes all three types of beta decay. About 89.28% of the time, it decays to calcium-40 (40Ca) with emission of a beta particle (β, an electron) with a maximum energy of 1.33 MeV and an antineutrino. About 10.72% of the time it decays to argon-40 (40Ar) by electron capture, with the emission of a 1.460 MeV gamma ray and a neutrino. The radioactive decay of this particular isotope explains the fact that argon is the cheapest totally inert gas available. 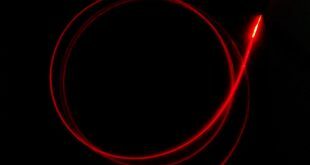 Very rarely (0.001% of the time) it will decay to 40Ar by emitting a positron (β+) and a neutrino. For our measure we used the crystal probe 63 x 63 mm. 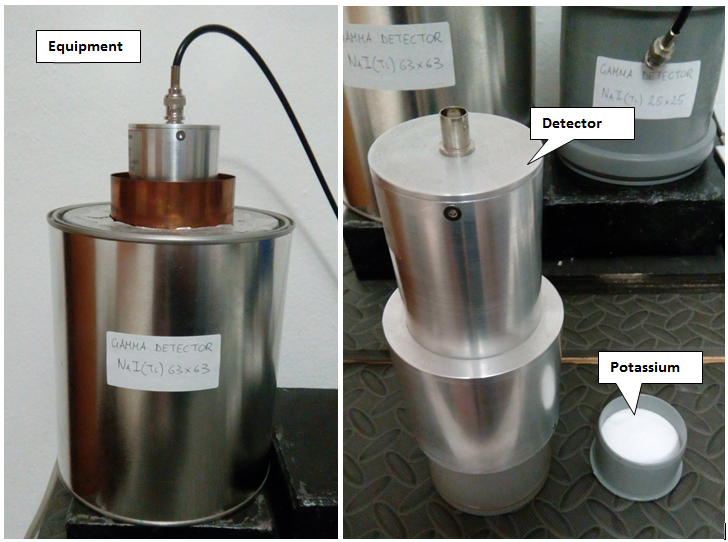 The image below shows the gamma probe in its shielded well and the sample being subjected to the measurement. For measurement we used the free BeqMoni software, suitable for quantitative measurements of radioactivity. This software could be downloaded at the following link : BeqMoni , and a short tutorial could be found at the link : Introduction to BeqMoni. The equipment has been calibrated with a 0,25 μCi point sample source of Cesium 137. However, this calibration is not adequate for the potassium sample since the latter is not a point source but has a disk shape, in addition, the 1460 KeV energy efficiency is definitely lower than the efficiency at Cesium 137 660 KeV. These limitations inevitably lead to slightly underestimating the activity of the sample. The image below shows the acquired spectrum, to which the background spectrum was superimposed. The colored green area corresponds to the ROI (region of interest) for the K 40: it is evident that there is a net contribution above the background due to the sample being tested. From the measurement you get a value of 2728 Bq/Kg, however, this value assumes that the fraction of the gamma decay of calibration cesium 137 is 100%, while it is actually only 80%, also it does not take into account that only the 11% decays of the K 40 produces the gamma photon at 1460 KeV. The value must then be corrected by taking these percentages into account, obtaining a value of 19840 Bq/Kg (19,8 Bq/g). Knowing the measured activity and the parameters of the detector it is possible to calculate the absolute activity. Detector parameters were obtained by the calibration procedure, with the exception of fγ that depends on the process being examined. Where N(t) is 0.0117 % of the number of potassium atoms present at the time of measurement (the number of potassium K 40 atoms). The exact value is 1,251 x 109 y, this difference with the measured value is due to the approximate calibration performed with a point source on energy of 660 KeV, while the measured sample consists of a disc and the energy is 1460 KeV, so the detector efficiency is slightly less.